An eyewitness account of current conditions in Fukushima 17 months after the tsunami and nuclear reactor melt-down will be given in a free, public program at Maui College on Sunday, August 5 at 6:30 pm in the Pilina Building multi-purpose room. Kay Fukumoto, President of Maui Taiko, will speak at the annual commemoration of the 1945 atomic bombings and radiation of Hiroshima and Nagasaki. She will give an update on the living conditions of people displaced by the Fukushima disaster, people who can’t go home again. Fukumoto was a member of a nine person team of Maui Taiko drummers who traveled to Eastern Japan in June as ambassadors of aloha. They performed in Iwaki, Miharu, Koriyama and Bandai Atami cities in the Fukushima Prefecture and in Yonezawa city in the Yamagata Prefecture. They were given tours of disaster areas in Minami Soma and Sendai and visited communities of people who are struggling to cope with loss of homes, jobs and community. Photos and video of the affected areas will be shown. The program will also include Koto music by Mika Inaba and Koko Walbee, a performance by Maui Taiko, interfaith prayers for peace, and a dance performance by Akari Ueoka and the Maui Izanai-Yosakoi Dancers. The public is invited to come between 5:30 and 6:30 pm to learn to make and then take home origami cranes. Refreshments will be served to all after the program. 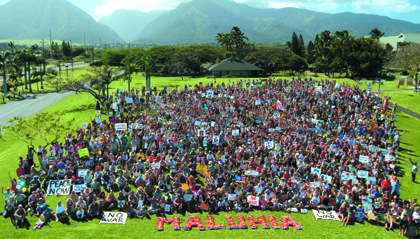 The sponsors are the the UH Maui College Peace Club and the Hiroshima/Nagasaki Commemoration Committee, a coalition of Maui organizations and individuals.